AUSTIN, TX – In the latest issue of the Austin Business Journal Website Developers survey for 2016-17, WEBii is ranked number 9. 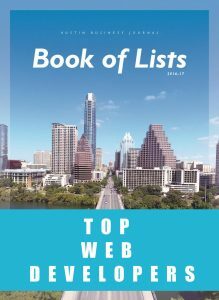 This marks another consecutive year that WEBii has been recognized on the Book of Lists report of top 25 web developers in Austin. The annual survey collects data about local web development companies, such as the number of completed projects, the ratio of web development work to other types of services offered, revenue, and top executives. With such an impressive array of digital agencies and a strong talent pool in Austin, the staff at WEBii is proud and honored by this recognition. Many other respected firms that have collaborated with WEBii were also recognized, including Hot Dog Marketing and HMG Creative. Readers can learn more about top ranked companies in the Austin Business Journal’s publication offered August 2017.